The debt clock is not just a metaphor – there actually is a real debt clock running on Sixth Avenue in Manhattan. 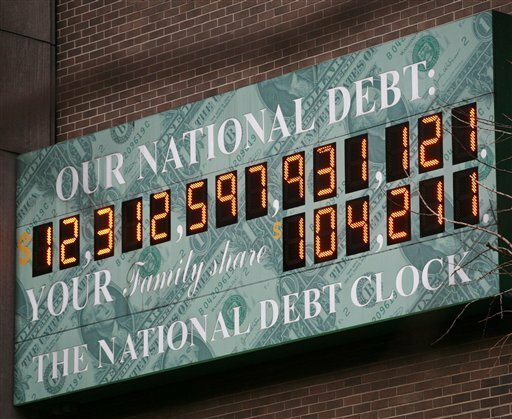 The national debt clock (as it’s formally known) is a clock that shows a running total of the United State’s gross national debt. This is shown in a dot-matrix display that constantly updates to stay up to the minute. It is billboard size and acts as a constant reminder of the national date that the United States faces. It really drives this point home too with an additional feature – the debt clock not only shows the overall debt owed by the US, but also the amount of debt owed by each American family. The debt clock was the brain child of real estate developer Seymour Durst who felt the need to highlight the rising national debt at the time. In 1989 he did this by sponsoring the installation of the first debt clock erected on 42nd street near Times Square. Interestingly during 2,000 to 2,002 the debt clock was switched off as the debt began to fall. In 2004 the initial debt clock was taken apart and replaced by the debt clock now running on Sixth Avenue today (just one block away from its predecessor). The new clock is outfitted with a dot-matrix display with a much higher resolution, but emulates the seven-segment numeral patterns. The clock now also has the (underused) functionality of being able to run backwards. In 2008 the debt clock reached $10 trillion – and the press widely reported that the debt clock had run out of digits – a grim reminder of the situation America is now in. An overhaul or replacement for the debt clock is being planned to add two more digits. While this is the debt clock that the phrase most usually refers too, there are countless other similar projects and even websites where you can see an up-to-date report of national debt. Why not make your own debt clock for your own financial debt? I never knew about this. Sort of interesting. This way we can see how much debt we are in. What a fascinating idea. Yep Jessel, the debt clock is a great idea. And that’s one huge debt. Wonder what every family seeing the debt clock thinks of. Shame on US leaders because of that enormous amount of money THEY owe! They are guilty. The debt clock’s purpose is to make us realize the situation we are in. It is bad to be in that much debt. No one should lend US money now. It is a critical situation and we don’t afford to get more loans. I hope we don’t need the debt clock to realize that. Every country should have a debt clock. It should be displayed in a crowded place in the capital. This way, most people would be informed about the debt level. The debt clock might be very useful. Too bad it is not that popular. The debt clock should be displayed in each country, as Vichy said. Citizens deserve to know where will their money go. I mean, it’s THEIR money, their work! Say yes to the debt clock! I would not like a debt clock. I would not like every time I go out to see that debt clock which tells me how much debts my country has. I’m glad I do not have my own debts. About the rest…I don’t care. I let the leadership to handle the debts they’ve made. I don’t see how a debt clock would help me. I don’t see how a debt clock which tells me about the debts of my country helps me with my own debts. I have my own ‘debt clock’. That clock is the one I care about. I hope, soon, it tells me 0. The debt clock keeps telling americans sad things. That they shouldn’t have been so greedy. If you don’t have money to buy an useless thing, then DON’T BUY IT. Well, know this debt clock will remind you that you mistook. The debt clock makes americans sad. Maybe they did not deserve this. You shouldn’t be so harsh on them, Addy. It’s what everyone in the world did. Lots of human beings got in debt because of the things they wanted to buy. No matter the country they lived in. Maybe we should have devices like the debt clock all over the world!! The debt clock is what should make americans protest! It is not possible to have such a huge debt. And so should do all the countries that face too much debt. WE should make the leaders do what we want. Not the other way around!